For a genealogist patience is a virtue. I will be the first to admit that I am a card-carrying member of the “instant gratification” generation. For me, and those of my ilk, information is at the tips of our fingers through the wonders of the Internet. Whether I am looking for the closest Chinese restaurant, or whether snakes snore, all I need is a computer (or my phone) and a wireless connection. This need for an instant answer does not bode well for my genealogy research…or my nerves. I try to remain patient when conducting my research, but I must admit that it is pretty difficult. This was especially true when researching my Great-Great-Great Grandfather, Philip Kuhn. I am lucky enough to have received some information on Philip through my family. I knew that Philip had been a musician for the 120th Ohio Regiment during the Civil War and I did what research I could on the Internet to find out more about him and his wife, Bertha. But not being able to travel to their home states of Ohio and Kansas, I finally came to a wall. I thought that Philip and Bertha Kuhn were just another example of family history disappeared. I stopped researching the pair and moved on to other branches of my tree. I’m not sure what made me Google “Philip Reymer Kuhn” a few months later, but I was not disappointed. My search came up with an interesting hit: “Letters, 1863-1865 by Philip Kuhn.” Awestruck, I quickly followed the link and landed on a citation on WorldCat, a website that lists the holdings of libraries across the country. The citation was for an archive of information that included letters from Philip to Bertha during the war and a photocopy of his discharge, among other things. I could not believe my luck! On the WorldCat system you are able to find the libraries that maintain the holding you are interested in, but in my case, no library was listed. The citation listed a myriad of interesting information, except for the crucial detail of location. Thus began my obsession with “Letters.” Knowing of the letters existence I was now like a donkey with a dangling carrot. But I was unfamiliar with the WorldCat system and had no idea how to track down the archive. I started by considering that a library or historical society close to where Philip and Bertha had lived would have been gifted the archive. I knew that they had lived in Ohio during the war, but soon after moved to Missouri and Kansas, finally settling in Baldwin City, Kansas. I sent an email to the Baldwin City Library and the Douglas County, Kansas, Historical Society thinking that Philip and Bertha would have kept the letters until they passed. Perhaps the Society or library would know of such an archive. I received a quick response from the history resources volunteer of the Baldwin City Library: they did not have the letters. The library was able to send me Philip’s obituary which mentioned that his children attended Baker University. Could this connection with the university mean that my documents were in their library? Well, the answer is no. And the University of Kansas is also located in Douglas County and has a large collection of Kansas documents but there was no record of the archive there either. There was no knowledge on any community genealogy message boards and no further information on WorldCat, despite having tried numerous times hoping that just maybe more information would be posted. ﻿﻿I am nothing if not tenacious, but even I was beginning to feel that my brick wall may very well be one I could not scale. It was about this time that my father sent me a newspaper article from the Kansas City Star about the genealogy library in Independence, Missouri. A part of the Mid-Continent Public Library System of the Kansas City metropolitan area, the Midwest Genealogy Center has a large collection of documents, books and resources from both the Midwest and beyond. Even though all my darts had missed the target, why not one more try? ﻿﻿﻿﻿So I sent yet another email to yet another source quite frankly not holding out much hope. Within a few hours I received a response that they did not have the archive in their holdings. Of course, story of my life. But when they looked in WorldCat they were able to determine that the archive was in the Special Collections Department of Northwestern University in Evanston, Illinois. Success! After months of searching, I had found the war time correspondence of my Civil War-era grandfather. Sadly, I realized that if I had only gone to my local library I could have probably learned of the archives whereabouts much sooner, but then the moment of finding them would not have been as sweet. A portion of a civil war-era letter from Philip Kuhn to his wife, Bertha. I immediately found the contact information for the McCormick Library of Special Collections and sent a request, along with the citation from WorldCat. Within two weeks a copy of the archive arrived. Only a genealogist would understand the anticipation and excitement I felt when the packet was delivered. Savoring my success, I scoured through the documents which included several letters from Philip to Bertha, a letter from Bertha to Philip and a copy of his discharge from service, among other things. As genealogists we have many statistics on our ancestors: birth, marriage and death dates, cities and counties of residence, children’s names. But it is a truly rare instance to be able to fill the spaces with their actual thoughts, dreams and desires. The archive was a wealth of information. Not only were the documents a first hand account of the events of the 1860s, but also a wealth of leads to which I could find out more about Philip and Bertha Kuhn. I learned that Philip was a prisoner of war held by the Confederate Army in Camp Ford, Texas. I learned that Bertha was home alone with two young children for four years while Philip fought a war. Being a military member and spouse, as well as a mother, I felt a connection with Bertha that I had not before. I did not come across this genealogical gem instantly, but I believe that my tendency to quick gratification fueled my desire and pushed me to continue researching, even if the road seemed a trifle crooked. I will take away several lessons from my adventures with Philip and Bertha, but the most important is that patience and creativity are keys to success in family research. Although it is not in my nature, I see now more than ever that the successful genealogist is the epitome of patience, and it sometimes takes a great success to make that patience worth while. Thanks so much for sharing your story! 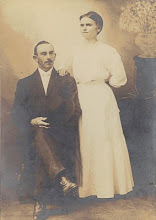 It was great to know you found your ancestors' papers--and how WorldCat.org helped you connect to the library who held them, finally. We'd love to re-tell your story to other libraries, about the value of WorldCat and how it helps researchers. Would you mind if we re-printed your story--with attribution and links to this blog, of course?